What is the smell of rain? Part of the show What Happens to a Tankful of Fish in Orbit? What makes the distinctive smell immediately after it's rained? Beryl - Well, I looked it up and the actual answer is that we really don't know! Odour is something that has to be a volatile chemical of some sort; it's a compound that goes to your nose and the receptors in your nose absorb that chemical. So it has to be some sort of chemical that's in the air. In the 1960s, two researchers - Bear and Thomas in Australia - extracted some oil from clay. They thought that oil had a biological origin and they thought it smelled like the smell of rain. That was all the research that was done on it for ten years. And then in the 1970s, Nancy Gerber, who was one of the very prominent researchers in taste and odour, isolated three chemicals from actinomycetes. Diana - Actinomycetes are bacteria that live in soil and break down plant material like leaves and twigs, making compost. Beryl - One of those chemicals was 2-isopropyl-3methoxypyrazine which is what she thought Bear and Thomas had originally isolated. It was a chemical that smelled like rain. She published that she thought this might be the chemical that made the smell of rain and she thought it might have been the chemical that Bear and Thomas had isolated. And that was it, nobody's done anything since as far as I can tell. 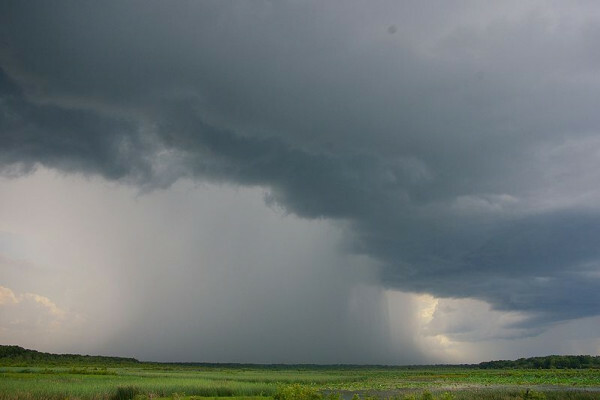 It might be that the smell of rain comes from Actinomycetes and it might not. At the moment, nobody really knows as far as I can tell. Diana - So it could be that these bacteria are producing this smell but the odour jury is still out on this one. We had some suggestions on the forum, including Tay who said it could be plants emitting lots of gases when they get wet and their pores open. And our "Forumer of the Week" award goes to Variola who identified the smell as geosmin, an organic compound which bacteria - the actinomycetes - produce when they die, usually after the soil has been disturbed or it's rained following a dry period. Geosmin is one of the other chemicals that Nancy Gerber, whom our expert answerer mentioned, isolated when tracking down the earthy smell. Previous What is the point of space exploration? Next Will Cubesats increase the Space Junk problem?